Thanks to TLC Book Tours, we're pleased to present a review for Late Lights, a new collection of short stories by Kara Weiss. Make sure to check out the rest of the tour stops to see other reviews! After spending his teens in juvenile detention, Monty is released to find he has nowhere to turn except back to the friends of his youth. But neither BJ nor Erin know how to have him in their lives anymore. As kids, BJ and Monty shared the anguish of being forgotten children, playing basketball and wandering the streets, but BJ has since aged out of her tomboy persona and into a sexually-confused woman in an adult body she doesn't understand, particularly when Monty is the first guy to view her as a woman. Although Erin Broder never gave up on her friendship with Monty, she doesn’t know where he fits into her upward-bound life, which is filled with professional parents, varsity track, and an Ivy League destiny. To the Broder family, young Monty was a charity case, a kid from the wrong side of Tremont Street, a novelty friend they hoped Erin would outgrow. So what happens when she doesn’t? With sharp language and unflinching honesty, Kara Weiss depicts a complex reality where adolescent friendship is less like a two-way street, more like a six-way interchange with broken signals. For fans of Denis Johnson, Amy Bloom, and Cormac McCarthy. 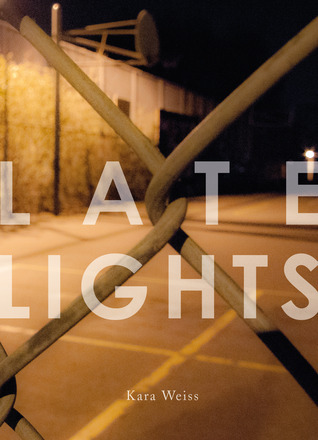 Late Lights is a collection of interconnected short stories centering around three teenagers: Monty, who has been in and out of juvenile detention; Erin, a friend of Monty's who still hasn't given up on him; and B.J., a young woman struggling with her gender presentation. Their lives intersect in interesting, and sometimes tragic, ways as we see short snippets of their lives from their mid-teen years through college. The writing in this book is so tight that I'm kind of in love. The way the stories weave in and out is very elegantly done, and all of the characters (leads and minor alike) will break your heart. You see the assumptions people make about each of the characters -- Monty's a troublemaker, Erin's a stand-out student, B.J. 's just confused -- and you get to dig into the explanations and backstories that challenge that. You wind up feeling for each of them as they struggle through some tough years, but you also want to reach out and shake them, get them to make smarter choices. I don't want to talk too much about the story because some of the biggest moments were things that took me by surprise, or elements that took a few stories to really fully play out. Weiss' writing is evocative, sparse when it needs to be, and full of detail and emotion when appropriate. Because these are all short vignettes that skip around in time, there's a lot left to the imagination and some reading between the lines that you have to do, which could be frustrating to some readers. (I did some flipping back and forth between pages to see if I just missed something in the previous section, or if it just wasn't there.) Above all, though, I found the stories to be very honest about the realities of growing up, for both kids from the wrong side of the tracks, like Monty, and kids who had it all, like Erin. The story leaves off in the mid-college years, so you are left to imagine what happens next for this trio. You can hope for a happy ending, if that's what you like, but Weiss doesn't try to fool the reader into thinking that everything will be all sunshine and roses, either. Although a very quick read -- I read it on and off over the course of an evening -- the subject material can be heavy, and may tend to stick with you for a while. This book contains themes including physical abuse, parental neglect, death, depression, self-harm, gender or body dysphoria, sexual assault, adultery, and others, so while the book is about teenagers and young adults, I think the book is best geared towards more mature readers. That tight writing you talk about has this book high on my list.